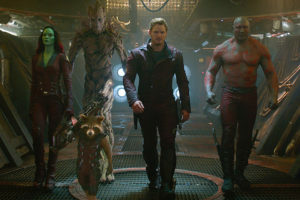 Everyone, if not most of the Geeks, knew that when Disney fired James Gunn based on past tweets regarding racism, pedophilia, homophobia, and other “ill-hearted” comments on social media, the Guardians of the Galaxy franchise was in peril and in limbo. For months on end, numerous stars beginning with the movie’s cast have come out and championed and in a way lobbied for James’ re-instatement into the film, supposedly the last in a planned trilogy that James himself has already written the script for. But in spite of this and continued support from the fans, Disney refused to budge. According to the Chairman of Walt Disney Studios, Alan Horn, “The offensive attitudes and statements discovered on James’ Twitter feed are indefensible and inconsistent with the studio’s values, and we have severed their business relationship with him.”If you must know, the tweets, which have long disappeared are actually old and from ten years ago! 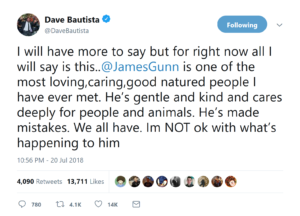 Since his firing, James has deactivated his website and has publicly issued an apology that everyone felt was sincere and heartfelt, saying that the tweets he made were in the past and it was from a frame of mind that belonged to an earlier version of him, to which he now has matured and moved away from. This change he defends is reflected in his work and in his inter-personal relationships with people in the industry. While the fans waited, DC Films and Warner Bros, were able to nab the director to helm the sequel to Suicide Squad. Since he got on board, there were CHANGES made to that franchise, from firing Will Smith and adding new characters. Since then that was all everyone had to know regarding the directors next work. 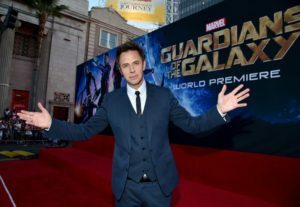 In a surprising turn of events today, Disney has announced that it is re-hiring James Gunn to direct Guardians of the Galaxy Vol. 3, in spite of them earlier saying that they will never work with him again. At the height of the controversy Marvel President, Kevin Feige, did confirm that they were still pushing through with the use of James’ script when they start production. But with all the fuss about who is associated with the project and who still wants to work on the franchise, everything was up in the air, up until today. 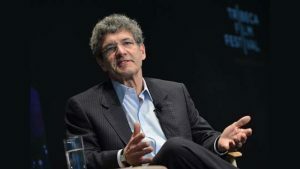 According to insiders, Disney chair Alan Horn, was the the one who met with James after firing him and in the course of time was persuaded to change his mind after he saw how Gunn himself handled the situation. Yes, it pays to not bad mouth your former employer. While it was indeed no secret that cast members and peers were vocal about their support, it is certainly by no stretch of the imagination that all this pressure and support help sway the vote in James’ favor. As a show of good faith, Marvel has actually allowed Gunn to complete his work on Suicide Squad 2 before returning to finish what he started for Guardians of the Galaxy 3. So think it was a good decision to bring James back? James had this to say over his Twitter.